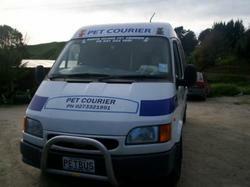 I started the Petbus in 2006 originally named North Island Pet Couriers. had 2 litters of pups on the ground 22 puppy's !!! - I normally flew my pups to their new homes but upon having a terrible experience with air travel decided to find another means of transport. ones to feathers and scales of all shapes and sizes. I have learnt a lot over the past 10 years with caring and transporting animals so you can rest assured with this experience your pets are in safe hands. after 3 years ventured into the south island. I began to outgrow the transit and hooked on a trailer to give me more space, but after a year the business growing by reputation I needed to get a bigger vehicle. says goodbye to a special friend. to kunekune – today has brought tears, not smiles. Chappell, stoically surveying the scene. Chappell and McLauchlan, reclining on a beanbag propped against the dashboard (McLauchlan's's dog Nellie, in a trailer behind the bus, is equally tranquil). touch ferrets, or anything larger than a big dog. venture, a pet auctions website. says. "You get to see the country." do it', and it was the best thing I've ever done." tester," he smiles. "But I am lucky, she is a beautiful woman."